Sen. Dan Sullivan, with his wife, Julie Fate Sullivan, thanks Vice President Joe Biden after a ceremonial swearing-in in the Old Senate Chamber at the U.S. Capitol. 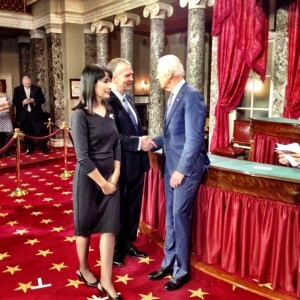 U.S. Sen. Dan Sullivan was sworn in today in the U.S. Senate Chamber, by Vice President Joe Biden. Sullivan is celebrating the milestone in a series of parties and dinners in Washington this week, attended by scores of Alaskan supporters and family members. Sullivan’s people crowded into a hearing room for one of several receptions and the hors d’oeuvres included a big slab of smoked salmon. 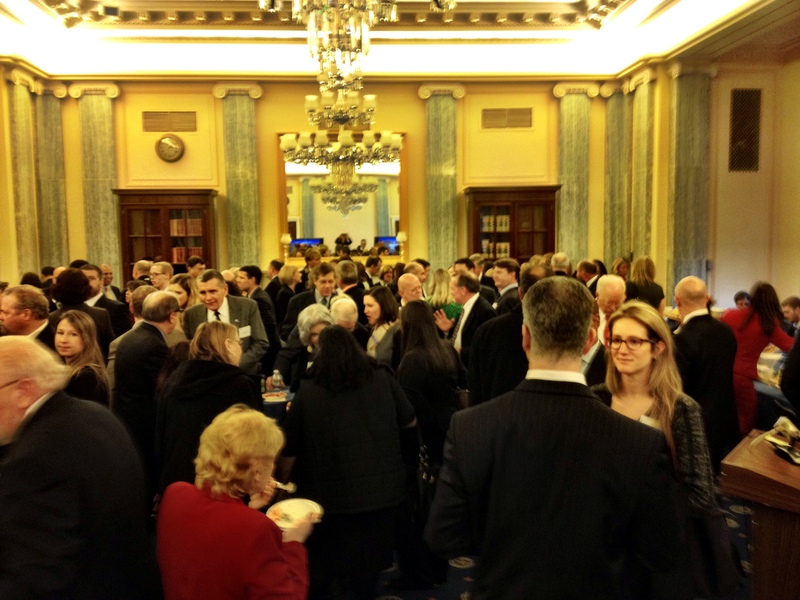 It was standing room only, spilling into the hallway of the Russell Senate Office Building. Sullivan said the reception was intended to thank all his supporters, in and out of state. “I was talking to Julie, I said, ‘All right, send this to all our Alaska supporters.’ (It’s a) long way to go, pretty expensive airline ticket, (I thought) maybe 20 or 30 Alaskans would come. And I think at last count we had well over 200 Alaskans!” Sullivan said, to hoots and applause. Alaskan guests included Gov. Bill Walker, and state legislators Click Bishop, Lynn Gattis and Bill Stoltze. Alaska Political consultants Art and April Hackney mingled with D.C. strategists like Carl Forti and Mike Dubke. Former Attorney General Gregg Renkes attended, as did developer Bob Penney and Washington lobbyists with long ties to the Alaska delegation, including Duncan Smith and David Russell. Sullivan’s parents came, along with his brother Frank Sullivan, CEO of RPM International, the paint company founded by the family. Sullivan said he had too many relatives in the room to name them all. “I’ve got a million cousins and nieces and nephews, and brothers and sisters, and sisters-in-laws and brothers-in-laws,” he said, adding that the Alaskans would surely bump into a Sullivan relative or two in the Capitol corridors, or in the dinners and receptions to come. After the official swearing in, the new senator went back to the Capitol for another swearing-in, also with Vice President Biden, but this one for the cameras in the ornate Old Senate Chamber. It was one senator at a time, with each family gathered ‘round. The procession ran long as Biden kissed every baby, congratulated the elderly, and signed family Bibles. When the freshman Senator from Colorado, Cory Gardner, came up, Biden called Gardner’s grandma on a cell phone. (She said she couldn’t talk because she was watching TV to see her grandson get sworn in as a U.S. Senator.) Sullivan, when it was his turn, approached with his teenage daughters. “This is Megan, this is Isabella, this Laurel,” Sullivan said, by way of introduction. “This is the Vice President of the United States. Alaskans mingled with Sullivan relatives at a reception in the Russell Senate Office Building. “Oh my God,” Biden said, conveying admiration as the girls pulled off perfectly formal how-do-you-dos. Biden joked to Sullivan that, with such beauties at home, he better have a good fence. “Oh, I got concertina wire,” said the senator. Earlier, in the real Senate chamber, as senators filtered in. Sullivan found his desk and shook hands with new Republican colleagues. He spoke briefly to Sen. John McCain, and had a longer chat with Sen. Jim Inhofe, who chairs the Environment and Public Works Committee, which Sullivan will serve on. Sen. Ted Cruz, who campaigned for Sullivan in Alaska, came by to say hello. Outside, in the corridor, Sullivan wasn’t letting it go to his head. As a freshman with the lowest seniority, Sullivan’s desk in the Senate is not in the chamber’s power spot. It’s on an outer edge, third row in, next to Iowa’s new senator, Joni Ernst. Still, it’s the United States Senate, so it’s one of the most powerful seats in the country, and, you could say, the world.